As businesses in every industry increasingly compete on the basis of customer experience, “customer centricity” has become the dominant motto of the modern enterprise. Yet an all-out focus on the customer overlooks the key ingredient in any recipe for outstanding customer experiences: highly engaged employees. Indeed, research shows that EX drives CX. CX leaders have 60 percent more engaged employees, and just a five percent increase in employee engagement can drive a three percent increase in revenue. Nowhere is the EX=CX connection more direct and clear than in the contact center and, given traditionally low agent engagement and high turnover, perhaps nowhere is the opportunity greater. Gartner predicts that by 2020, agent engagement will be the key differentiator for one out of five contact centers. Savvy contact center leaders are leveraging new tools and technologies to empower agents with better information, smarter workflows, inspiring feedback and empowering control over their careers. 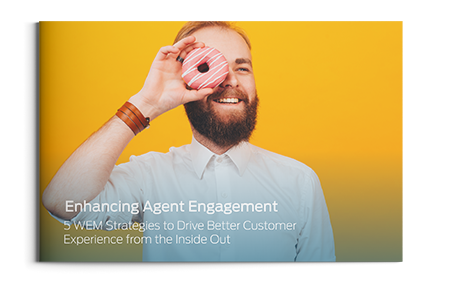 This ebook offers five proven strategies that leading contact centers use today to boost agent engagement, improve retention and enhance skill development to engineer better customer experiences from the inside out.